(I recommend that you double-click on this e-mail in your inbox to open it properly. You will then have a better view of all the text and pictures. Your new wallpaper: Dunes and a Springbok! African Hunting Stories... More Stories entered! Picture top right: We recently took this picture of a young "Panthera leo" during our visit to the Kgalagadi Transfrontier Park. I couldn't resist sharing such a naughty looking face with you! 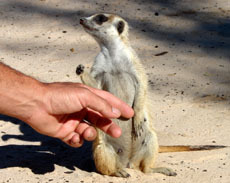 Read more about the Kgalagadi Park later in this Newsletter. 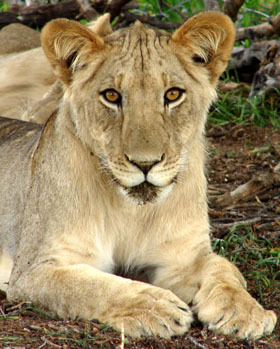 Lions Killing Hyenas - click here if you'd like to see the video! Hallo... from a Rare Show! Another WELCOME to more new e-zine subscribers! We hope that the "Kalahari Hunting News" will always be THE mail that you look most forward to receive in your Inbox. 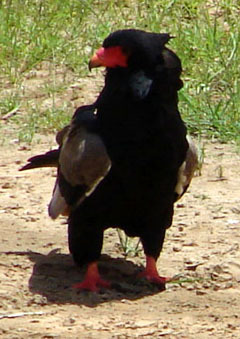 The Kalahari region is transformed in a paradise for man and animal. We are enjoying every minute of this rare and lovely show of nature. Dry and barren-looking red sand as far as the eye could see (as it was the case in December last year), has turned into a bright, green tapestry of grass. 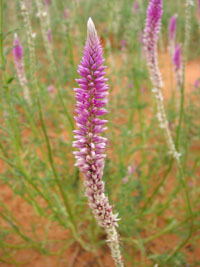 The occasional Kalahari flowers (like the pink Cat's Tail on the picture) amongst the green sea of grass provide the perfect finishing to an already beautiful picture - painted by our Creator. 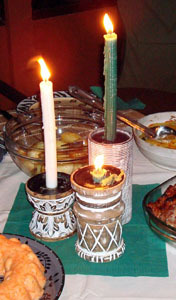 Another common sight at times of abundance... the Gemsbok cucumber (on the picture). 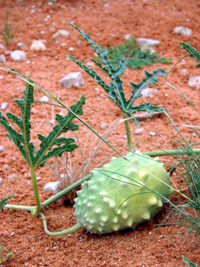 This Kalahari fruit is much favored by Gemsbok and mole-rats and supply moisture and food to the animals. Although the grass will soon (within a month) withers and yellows when the first frost of winter has come, the magic of this summer will linger in our minds. And the memory will sustain our hopes during any drought to come, because we know that there is always a next time! We've had a quiet early hunting season (from February to March). We're glad for that since it gave us time to bring some maintenance work on the ranch up-to-date. Our first guests will arrive next week. From then on we will be quite busy until October. 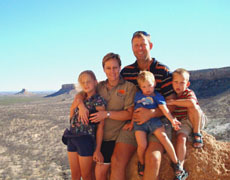 You can look forward to newsletters from Uitspan Ranch filled with hunting news, hunting pictures and hunting stories! The new free Kalahari Wallpaper for you this month, is a picture of a typical Kalahari scene after good rains. Click here to see this month's picture. Back Issues of our newsletter are now only available to you as subscribers. click here to find those Back Issues! 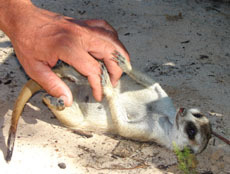 Below: Uitspan's female meerkat as she looked during the last few days of gestation. She liked to be stroked on that pregnant belly. 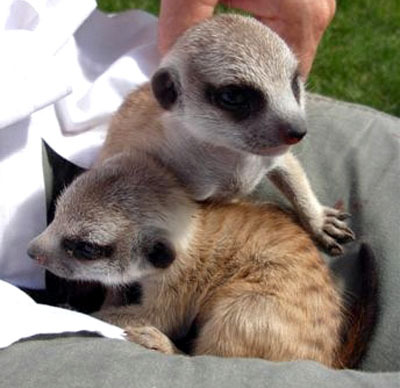 One day in early March the meerkats were not to be seen near the house, and Hendrik and Isabel knew immediately that this was a sign that the birth of their litter is near. Well, three little ones (one male and two females) were born in a burrow near the gravel road. The male and female are taking turns to baby-sit the little ones and they do it conscientiously and dutifully. This day-to-day vigilance and care are quite touching to observe. In September of last year, we had a group of 4 friends from San Antonio (Texas, USA) who hunted on Uitspan Ranch. 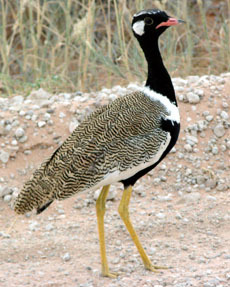 You can find info and pictures about their hunt in the October 2007 and December 2007 issues of Kalahari Hunting News. Mike Deodati, one of of this group, wrote down his experience of hunting on Uitspan Ranch and send it to us a few weeks ago. It is really funny (from his point of view ;o)) and we would like to share this story with you. Picture: The author of this Kalahari hunting story - Mike Deodati. 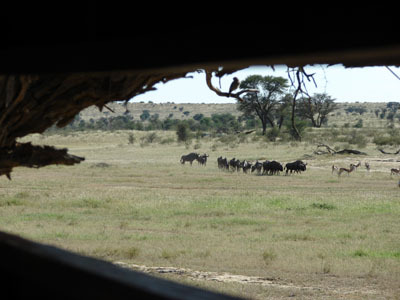 Click here to read Mike's Kalahari Hunt Experience! In February we visited the Kgalagadi Transfrontier Park. 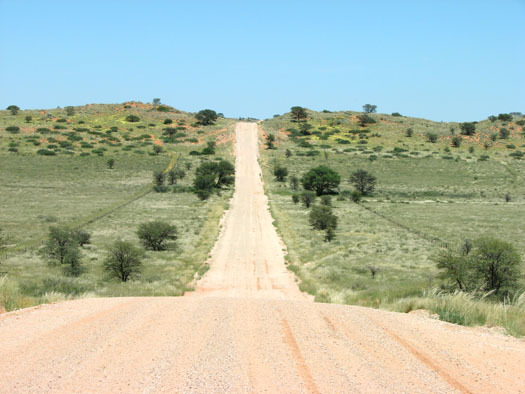 This National Park is only 220 km (136 miles) from Uitspan Ranch and visitors to Uitspan have the opportunity to go with us to the Kgalagadi on a special side trip. In April 1999, the presidents of South Africa and Botswana signed a treaty that linked the Gemsbok National Park of Botswana and the Kalahari Gemsbok National Park of South Africa under one unifying name - the "Kgalagadi Transfrontier Park". For long years the southern Kalahari and its parks have played second fiddle to the larger and better known conservation areas like Kruger, Chobe and Etosha. This turned out to be an unforgetable trip. 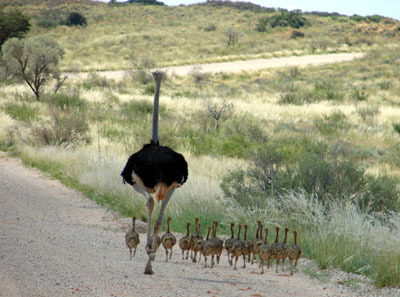 The Kgalagadi is not without reason known as "the unspoilt heart of the Kalahari thirstland"! The size of the Kgalagadi is quite overwhelming. The South African side comprises 9 591 km² (3 703 sq.miles). Add to that the further 28 400 km² (10 965 sq.miles) of the Botswana side and you're getting a HUGE Park! This means that the Park is almost twice as large as the Kruger National Park and one of the largest National Parks in the world! Although not all are resident species, 264 bird species have been recorded in the Park. Only 78 of these are residents while 152 are vagrants (irregular visitors). Some birds cannot survive all year round here and fly to areas where conditions are more favorable - either seasonally or occasionally. 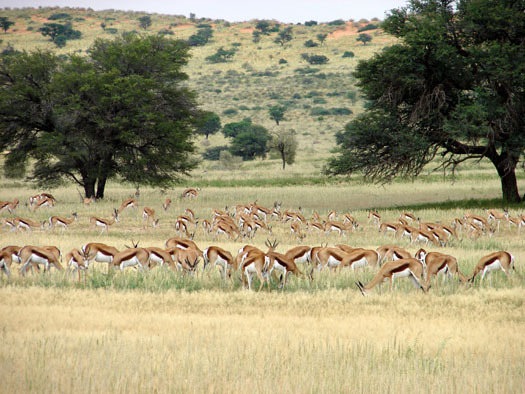 Below: A typical Kalahari scene: Springboks! (In recent days, we've spotted magnificent Kudu trophy bulls on Uitspan Ranch. They are breaking up the bachelor herds to join the Kudu cows for the mating season. Usually these "grey ghosts" are soooo elusive - and then we come across the bulls only once in a while. 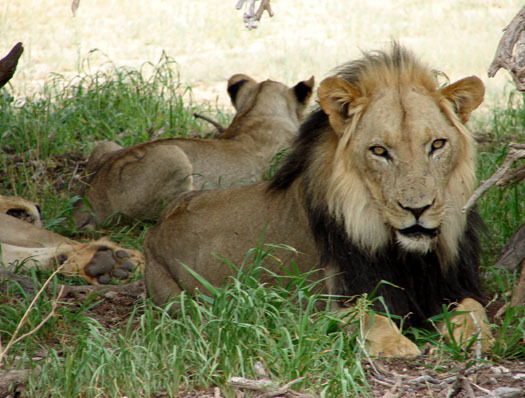 Below: A herd of 12 lions were sleeping under the shade of some trees. Our vehicle disturbed their midday siesta. This one didn't look impressed with our presence. 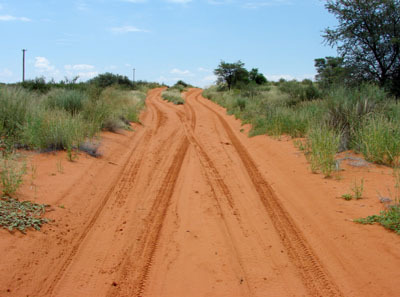 There is no better way to end a Kalahari Hunting safari than visiting the Kgalagadi Transfrontier Park. We recently did some updates on the Special Hunting Packages offered on our website. With the world's financial situation in a bit of a depression at the moment, it can't hurt to pay a lot less for your African Hunt Safari. You'll see that our packages are really unbeatable. We made it available for booking until July 1st, 2008. After that, we'll have no choice but to adjust the prices. 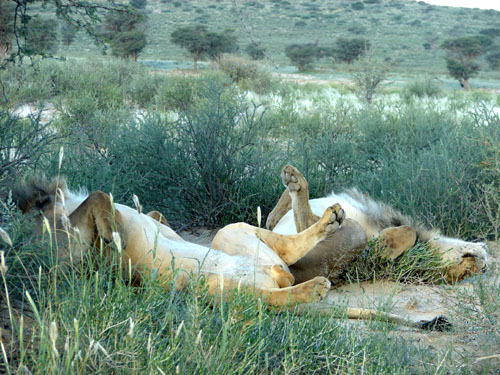 So, if you are interested - talk it over with your hunting buddy, get him to join you and come for a Kalahari hunt. Note that the special packages now include more choices of animals to harvest. Click here to have a look at the updated SPECIAL HUNTING PACKAGES we offer! Terry Blauwkamp wrote an article on Ammo and Guns. Especially if you are on your way to Africa, you will find Terry's views interesting. He and his wife Jo Ann have been to Africa many times. Since we launched the Hunting Story CONTEST on our website, we've received 11 African Hunting Stories. You are welcome to read them and give your comments on each (see details below every story)! Click on any of the titles below. It will take you to that story. 10. Gemsbok Will Fight Back! You can visit our African Hunting Stories-page for details and info on the contest. Click here to enter your own African Hunting Story. Coming to Southern Africa soon? Then learn some Afrikaans to make your trip even more enjoyable! A native Afrikaner, now at an University in the USA, created this website to learn people Afrikaans. We added a new comments-page on our website. This is especially for those of you who would like to comment on Kalahari Hunting News (this newsletter). It is always great to get feedback. So... please take a moment to Comment here on the Newsletter! The comments we receive, will be placed on that page of our site. Most of us have had conversations with people who does not like hunting or who doesn't understand the reasons for hunting. Well... you'll never again wonder what you should tell such a person if you read this. I updated a page on our website that had been there for very long. It includes some interesting facts about the "Definition and History of Hunting". All the heavenly bodies have their God-given places and move in a divinely prescribed course. Therefore man can tell just when the sun shall arise or set on a particular day in the future, and when the moon shall be full, or a new moon appears. God has it all under His perfect control. And the psalmist declares this in Psalm 148:3-6 with these words, "Praise ye Him, sun and moon: praise Him all ye stars of light, Praise Him, ye heavens of heavens, and ye waters that be above the heavens. Let them praise the name of the Lord: for He commanded and they were created. He hath also established them for ever and ever: He hath made a decree that shall not pass." Note that they came into being by His command, were established by Him, and made by a decree that shall not pass away. And since this is true of His work of creating, how much more wonderful and comforting is it to know that what He does in His grace comes by a command, and not by a wish, is established, and cannot be made to pass away or fail by man and his sinful will. And ever dwell before His face. How comforting to know that all those who were eternally written in the Lamb's book of life will irresistibly be drawn by God's grace out of unbelief into faith, and out of spiritual death into everlasting spiritual life. Surely we have undeniable reason to praise God for the salvation which He works in us by irresistible grace. Do that then today and every day of your life here below. You will do that in glory! ...the afflictions and vexations of the pious have little or nothing of bitterness, if compared with the boundless blessings of everlasting glory. We thank the PRCA, who made this Daily Meditations of Rev. Heys available for our Newsletter. Read more about their missions, literature and wonderful publications on their website PRCA. Two rednecks go on a fishing trip. They rent all the equipment - the reels, the rods, the wading suits, the rowboat, the car, and even a cabin in the woods. I mean they spend a fortune! The first day they go fishing, but they don't catch anything. The same thing happens on the second day, and on the third day. It goes on like this until finally, on the last day of their vacation, one of the men catches a fish. As they're driving home they're really depressed. One guy turns to the other and says, "Do you realize that this one lousy fish we caught cost us fifteen hundred bucks?" The other guy says, "Wow! Then it's a good thing we didn't catch any more!" If a friend DID forward this to you and if you like what you read, please subscribe by visiting...Kalahari Hunting News or leave us a message here! Did you know that YOU can build a website too? Take this quick tour now. !